ArthoZyme Plus Review – Is This Product Safe To Use? ArthoZyme Plus is not your ordinary joint supplement as it does not contain glucosamine or chondroitin which you will normally find in most joint supplements. Instead, it has a unique combination of vitamin D, Zinc, Boswellia, Bromelain, and Serratiopeptidase which are effective in promoting joint flexibility and mobility. It is also effective in reducing joint pain, inflammation, and stiffness. What is the Company Behind ArthoZyme Plus? ArthoZyme Plus is a natural joint supplement that aims to promote joint health by stimulating the body’s natural immune mechanism in order to fight off inflammation thereby promoting effective pain reduction. With the primary ingredients contained in this product, consumers (especially those who are allergic to shellfish products, since glucosamine is sourced from crustaceans) are given another option when it comes to joint health. 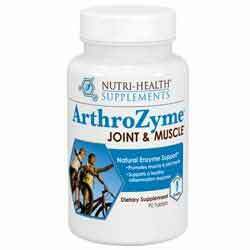 Not only does ArthoZyme Plus help improve joint health but it also contributes to bone and cartilage health. Its herbal components are scientifically proven to be effective in reducing inflammation and stiffness thus making this product one of the prime choices for joint health. ArthoZyme Plus is manufactured by Nutri-Health, company that specializes in health supplements, probiotics, and other nutritional products. Nutri-Health is based on Northern Arizona. What are the Ingredients Used in ArthoZyme Plus? Vitamin D – It is an important vitamin that is needed for strong bones and cartilages. Zinc – It is an essential mineral that is commonly used for boosting the immune system and enhancing the body’s natural anti-inflammatory mechanism. Boswellia – This herbal component is popular for its anti-inflammatory properties thus it is effective in reducing pain, inflammation, and stiffness of joints in people suffering from Osteoarthritis. Bromelain – This is a natural extract obtained from pineapples and is also popular for its natural anti-inflammatory properties. Serratiopeptidase – It is a natural ingredient which is extracted from silkworm and has been known for its anti-inflammatory benefits which are helpful for people suffering from osteoarthritis, inflammatory lung diseases, and even heart conditions. How does ArthoZyme Plus Works? ArthoZyme Plus works by supplying the body with additional nutrients which will boost the body’s natural immune response and anti-inflammatory mechanism. By boosting the immune system, the body’s ability to repair damaged tissues is also enhanced. ArthoZyme Plus also contains potent anti-inflammatory ingredients that reduce swelling on affected joints. When inflammation is reduced, impinged nerve endings are released thereby pain will be significantly reduced. Also, when inflammation is reduced, tensed muscles surrounding the joints are relaxed thereby allowing better movement which will result in improved joint mobility and flexibility. Overall, ArthoZyme Plus improves joint health by aiding in the repair of damaged joints, reducing inflammation, and decreasing the stiffness of the joints. The product does not contain glucosamine which is normally sourced from crustaceans. Therefore, this product is safe for people to have known allergy to shellfish and cannot take glucosamine. It may reduce swelling of joints in people suffering from osteoarthritis. What are the Cons of ArthoZyme Plus? The product does not contain ingredients which are primarily needed for the repair of damaged joint tissues like glucosamine, chondroitin, MSM, and collagen. You need to take two capsules in a day to achieve the required daily intake. Nutri-Health recommends that 2 capsules of ArthoZyme Plus are to be taken daily. It is best to take them along with food to prevent a gastric upset. Is ArthoZyme Plus A Scam? It does not appear that this product is a scam. While it is true that this supplement does not contain any ingredient needed for the repair of joints like glucosamine, chondroitin, MSM and/or collagen; the product offers a different approach in tackling joint problems like pain, swelling, and stiffness. The combination of the ingredients in this product can also be effective in reducing joint pain and stiffness. It also strengthens the cartilage and bones, therefore, preventing further damage to the joints. It also enhances joints flexibility. It may not be as effective as other joint supplements because it lacks ingredients that support joint repair and optimum joint health like glucosamine, chondroitin, MSM, and collagen. With these note, it may not already be effective for people who has been suffering from chronic joint conditions because it lacks the necessary building blocks for joint repair, especially collagen. However, ArthoZyme Plus offers an excellent alternative for people who have tried glucosamine containing supplements and did not experience good results. The supplement has a more general effect rather than having a targeted approach towards joint repair.